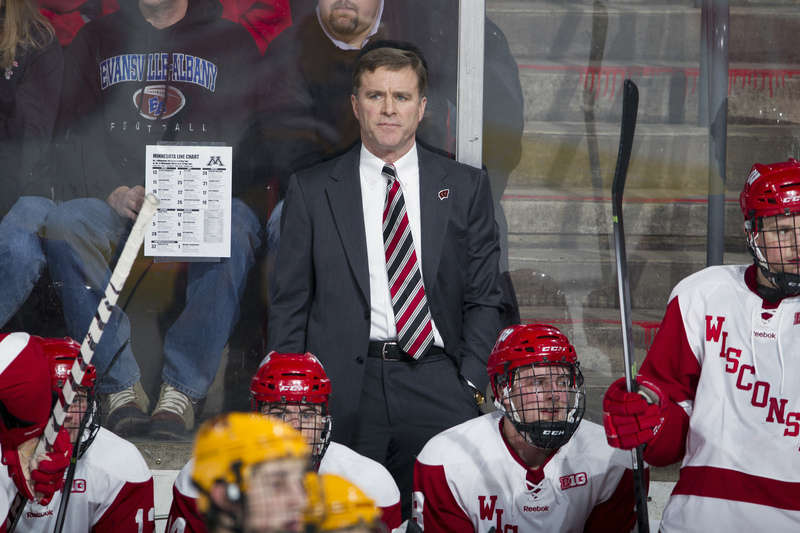 Mike Eaves has accomplished a considerable amount as Wisconsin‘s hockey coach in his 14-seasons on the job, not to mention a distinguished playing career. But back-to-back losing seasons has cost Eaves his job. Eaves remains the all-time leading scorer in program history, a three-time captain, a two-time MVP and a member of the UW Athletic Hall of Fame. Wisconsin athletic director Barry Alvarez fired Eaves today after the Badgers saw their season end with a 5-2 loss to Penn State in the opening round of the Big Ten Tournament on Thursday in St. Paul, Minnesota. After a 24-win season two years ago, the Badgers have managed to win just 12-games over the last two seasons. After winning just four games last season, the Badgers doubled that total, winning just eight this past season. Wisconsin’s 4-26-5 record a year ago was the fewest wins and most losses in a single season in modern program history. Eaves accomplishments as a player and coach made the decision difficult for Alvarez. “I like Mike and I respect Mike,” Alvarez said. “All those things play into it. That’s what makes it very hard. Eaves teams compiled a 267-225-66 (.538) record and made seven NCAA tournament appearances, including winning the 2006 NCAA title and finishing runner-up in 2010, during his 14 seasons at the helm.